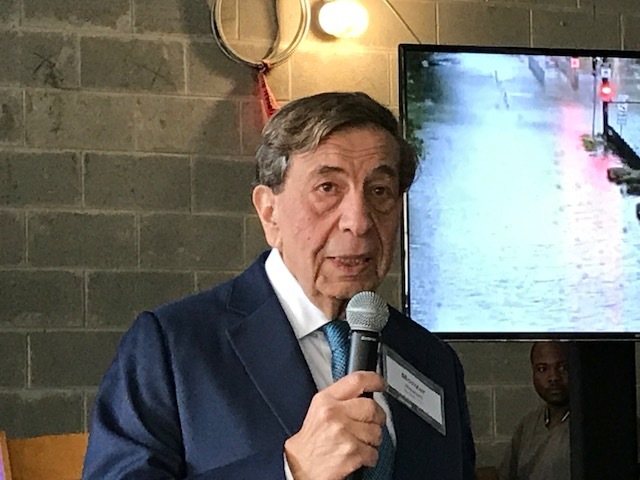 Monzer Hourani announced Medistar’s plan to develop a medical tower on Main Street near Houston’s Texas Medical Center. Photo credit: Ralph Bivins, Realty News Report. HOUSTON – (Realty News Report) – Medistar Corp. of Houston is developing a 33-story, 550,000-SF medical office tower at 6700 Main Street on the western edge of the Texas Medical Center, Medistar founder Monzer Hourani said. The medical tower will be built on the site of the SureStay Plus Hotel by Best Western, which will be demolished, Hourani said. The site is on the west side of Main Street near Southgate Boulevard, near Texas Children’s Hospital. “The medical tower will be a huge tower with a parking garage, restaurants and shops around it,” Hourani said. The medical building will be linked by skybridge to the new 353-room InterContinental Hotel and the new 35-story Latitude Med Center apartment tower, both scheduled to open in 2018. Medistar is developing the InterContinental in partnership with TRC Capital Partners and the apartment tower is being developed by a Greystar/Medistar partnership. Hourani unveiled plans for the medical tower at a topping-out ceremony for the 375-unit Greystar residential tower. Hourani said Medistar’s new medical tower will appeal to the growing demand emerging from the 1,345-acre Texas Medical Center, the largest medical complex in the world with 21 hospitals, a number of medical schools and more than 100,000 employees. The new medical tower, combined with the new Greystar apartment and InterContinental hotel, represents one of the largest developments under construction in Texas. Although the Medistar firm is primarily known for its medical-related projects, the company also has developed land, including the 150-acre ParkWest Business Park in Katy. Other Medistar projects currently under development include PAM Rehabilitation Hospitals in Corpus Christi and Round Rock; a 60,000-SF medical office building in Webster; and VibraLife post-acute care facilities in Katy and El Paso.